A team of scientists from the U.S. Department of Energy's (DOE) Brookhaven National Laboratory and Stony Brook University has discovered that subtle imperfections can dramatically increase the efficiency and ultraviolet (UV) light output of certain LED materials. "The results are surprising and completely counterintuitive," said Brookhaven Lab scientist Mingzhao Liu, the senior author on the study. "These almost imperceptible flaws, which turned out to be missing oxygen in the surface of zinc oxide nanowires, actually enhance performance. This revelation may inspire new nanomaterial designs far beyond LEDs that would otherwise have been reflexively dismissed." The results, published online Dec. 5, 2017, in Applied Physics Letters, help bring these zinc oxide structures one step closer to use as a UV source in practical applications, including medical sensors, catalysts, and even household lighting. "The current LED standard for UV light is gallium nitride, which functions beautifully but is both expensive and is far from being environmentally friendly," said Brookhaven scientist and study coauthor Dario Stacchiola. "This 'imperfect' zinc oxide overcomes those issues." The scientists leveraged the singular instrumentation and expertise available at Brookhaven Lab's Center for Functional Nanomaterials (CFN) and National Synchrotron Light Source II (NSLS-II), both DOE Office of Science User Facilities. "Having the capability of exploring materials from synthesis to complex characterization is a unique advantage of Brookhaven Lab," Stacchiola said. "In fact, the puzzle of zinc-oxide nanowire emission efficiency could only be solved when new instruments came online at NSLS-II." The high-performing LEDs exploit a phenomenon called near band edge (NBE) photoluminescence found in semiconducting materials. "When electrons in the conduction band recombine with holes in the valence band—crossing the edge of the so-called band gap—they can emit light," Liu said. "Optimizing that effect, specifically for UV radiation, was our primary goal." The scientists used a relatively simple low-temperature solution-based approach to grow nanowires composed of zinc-oxide crystals. They then applied oxygen plasma to clean the final nanowire structures. "By chance, during one test, we executed this plasma step under much lower pressure than usual—and the results were serendipitous and shocking," Liu said. "That low-pressure plasma treatment is the real game changer here." The unexpected NBE emissions have puzzled scientists for years, but the investigative tools finally advanced enough to shed light on the mystery. The key for the breakthrough came through strong synergy between two beamlines at NSLS-II. Data from beamline 8-ID—one of the most intense x-ray absorption sources in the world—combined with the first set of results from a new, state-of-the-art x-ray photoemission electron microscopy (XPEEM) endstation at beamline 21-ID-2. The XPEEM endstation is run as a partnership between CFN and NSLS-II. Beamline 8-ID revealed the amount of x-ray absorption, which was then used to deduce the oxidative state of the samples. The measurements at beamline 21-ID-2 complemented that work, bombarding the sample with x-rays to excite electrons and emit photons according to the band levels of the sample. By analyzing that energy, the band positions—and their role in light emission—could be determined with high precision. "We found that surface oxygen vacancies create dipoles that confine charge carriers to the core of the nanowire," said study coauthor and NSLS-II scientist Klaus Attenkofer. "These vacancies appear to drive the highly efficient and pure light emission. And because we know exactly what distinguishes this zinc-oxide structure, we know how to build on it and explore similar materials." The new synthesis technique enables additional structures, such as high-quality, titanium oxide layers, which could be ideal for photocatalysts. Such a material could efficiently act as a water-splitter, providing hydrogen fuel for a host of renewable energy technologies. Future experiments will explore this possibility and even watch the catalytic reactions unfold in real time. "The strong synergy between CFN and NSLS-II makes Brookhaven Lab a unique place to do nanomaterials research," said Chuck Black, the director of the CFN. "Working closely together, the two facilities are developing and offering new research capabilities for the benefit of researchers worldwide. These forefront tools are critical for accelerating nanoscience research, which will enable the advanced materials of tomorrow." 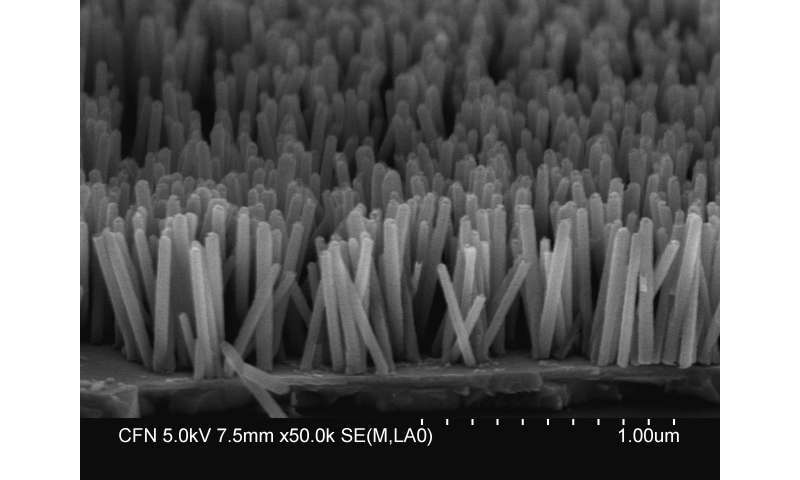 These with PV can help purify water by killing microbes.